The first planets outside the solar system were discovered 25 years ago - not around a normal star like our Sun, but instead orbiting a tiny, super-dense 'neutron star'. These remnants are left over after a supernova, the titanic explosion of a star many times more massive than our own. The two scientists observed Geminga using the James Clerk Maxwell Telescope (JCMT), which operates at submillimetre wavelengths, sited on Hawaii. The light the astronomers detected has a wavelength of about half a millimetre, is invisible to the human eye, and struggles to get through the Earth's atmosphere. Holland, part of the group that built the JCMT camera the team used - called 'SCUBA' - notes: "What we saw was very faint. To be sure, we went back to it in 2013 with the new camera our Edinburgh-based team had built, SCUBA-2, which we also put on JCMT. Combining the two sets of data helped to ensure we weren't just seeing some faint artefacts." 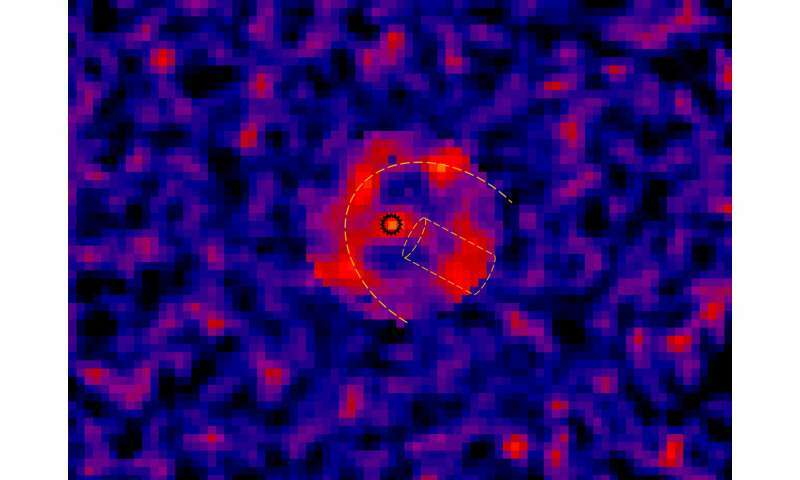 Both images showed a signal towards the pulsar, plus an arc around it. Greaves adds: "This seems to be like a bow-wave - Geminga is moving incredibly fast through our Galaxy, much faster than the speed of sound in interstellar gas. 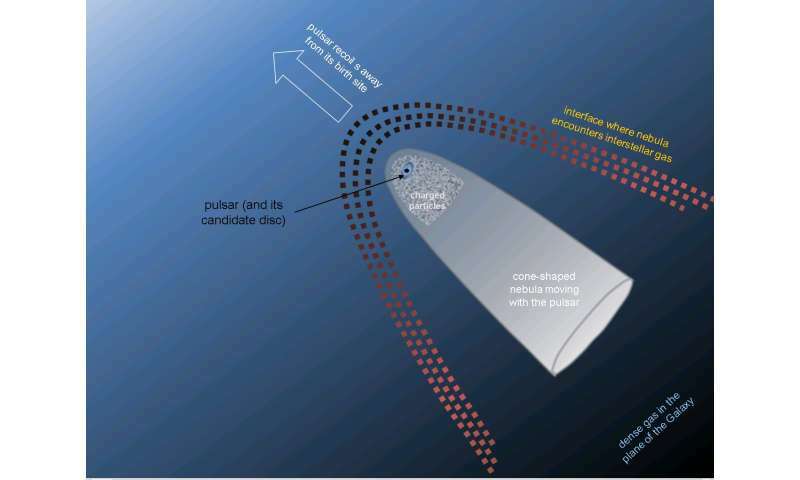 We think material gets caught up in the bow-wave, and then some solid particles drift in towards the pulsar." Greaves cautions that more data is still needed to tackle this quarter of a century old puzzle: "Our image is quite fuzzy, so we've applied for time on the international Atacama Large Millimetre Array - ALMA - to get more detail. We're certainly hoping to see this space-grit orbiting nicely around the pulsar, rather than some distant blob of Galactic background!"